About 54 per cent of all vehicles financed right now carry a term of 84 months or longer and inventory is high, according to J.D. Power. 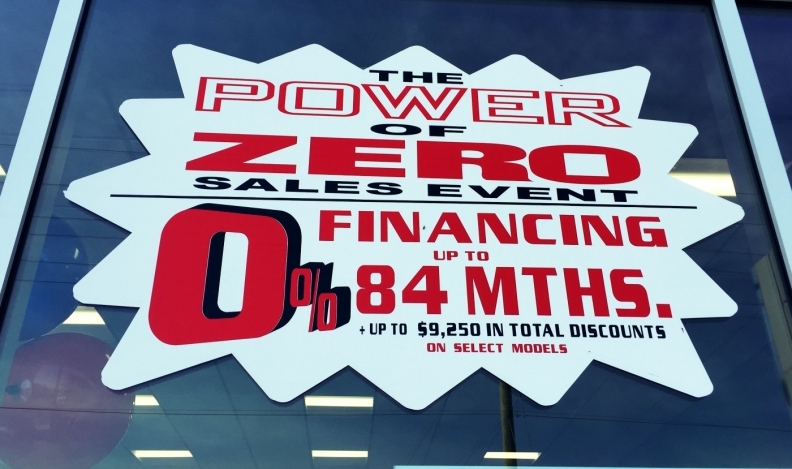 The size of incentives Canadian auto dealers are offering customers is entering “uncharted territory” as sales peak, says J.D. Power auto analyst Robert Karwel. The U.S. marketing firm’s Canadian arm in Toronto has found the average incentive was worth about $5,900 on each new car and light duty truck sold during the first quarter of 2017. Broken down further, the average incentive on a light duty truck was $6,307, up 0.3 per cent from the same quarter in 2016; the average incentive on a new car was $4,230, up 5.2 per cent over last year. Karwel said most of the increase can be attributed to people shifting to pickups and utility vehicles, which on average have higher incentives, from cars. Some full-size trucks can have five-figure incentives, he said. But, they are still adding to the pool of money. Total industry incentives in 2016 hit $550 million and about $60 million of that was new money offered by manufacturers, Karwel said. “We’re not trying to say there is this massive lift in incentive spending for no other reason than it’s all new incentive money. It’s being driven by mixed shift [to utility vehicles and trucks] but there is still a small portion of incentive money that is fresh new incremental spending,” Karwel said. Incentives now account for about 15 per cent of the manufacturer’s suggested retail price. Canada set annual sales records in each of the previous two years and the first quarter of 2017 is off to another roaring start, setting a new sales records in each of the first three months of the year. “Probably next year, manufacturers are going to move to a share-preservation mode rather than a growth mode,” Karwel said. Similar increases in incentives have been seen in the United States, where the average new-vehicle incentive was US $3,900, up from US $3,400. A high level of incentives poses “significant risk of long-term damage to the industry,” said Thomas King, vice president, Power Information Network U.S. OEM operations, media and marketing, for J.D. Power. Other risks include an increase in loans with terms up to 84 months and higher inventory levels, King said. Nearly a quarter of new cars on Canadian lots are from the 2016 model year and must be sold.